We must have a valid copy of the purchaser's ATF License with an original ink signature (we prefer blue ink). Also, bring a valid photo ID with you when you come to pick up your order. We strongly recommend that all customers get a full "User" license (good for 3 years) and not the "Limited" permit (with purchase coupons for 1 year.) We will charge an additional $50 processing fee for all "Limited Permit-Coupon" purchases. If the ATF License is under a company name we also need a copy of the ATF "Notice of Clearance", showing the Responsible Person(s) under the company license. Only those persons listed as a "Responsible Person" (highlighted on example to the right) can pick up fireworks. An "Employee Possessor" CANNOT order or receive fireworks without an "Authorization Form". by Email - NLClicenseapplication@atf.gov, or call (304) 616-4400. 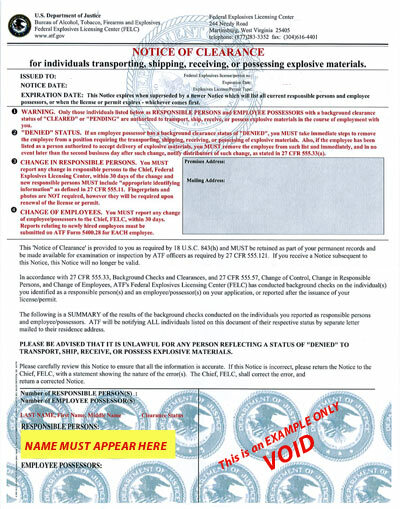 If the person ordering and/or picking up the order is not listed as a "Responsible Person" on the notice of clearance, an "Authorization to Order and Receive Explosives" form must be completed and signed by a responsible person. Any individual or company purchasing any amount of black powder for use in fireworks must possess an ATF License. "Letter from ATF on black powder sales"
Ace Pyro requires a statement of intended use certifying that the individual qualifies for the sporting, recreational or cultural purposes in antique firearms or in antique devices ATF exemption. Download the "Statement of intended use of black powder"
In order to receive our no substitution guarantee you must first pay for your order in full or send a non-refundable deposit equal to 50% of the total due. After we get your full payment or deposit, we will hold your order. Due to the nature of our business we do not offer a refund on any deposit. Once a deposit is made the items on your order are removed from our sellable inventory, therefore they will no longer be listed for sale. If you are unable to complete your purchase you will forfeit that deposit because we will have lost the opportunity to sell those items while they were being held for you. You also may be required to pay an additional 25% re-stocking fee. The List Price is our regular full price. All discounts are calculated from the List Price values. Orders must be paid in full at time of pick-up, delivery or before being shipped. Credit cards may be processed in person or over the phone. Call our office at (877) 223-3552 to process your credit card payment. Our office hours are Monday thru Friday, Monday - Friday, 9 am - 5 pm EST. *For non-cash (credit card or PayPal) payment our 3% cash discount will be removed. Cumulative discounts are calculated on a per account basis. Cumulative discounts will be applied automatically in the online shopping cart based on the account's order history. For example, an order containing $1,000 of display fireworks and $100 of consumer fireworks yields a sub total of $1,100. Therefore, a 5% discount will be applied toward the display fireworks but no discount will be applied toward the consumer fireworks on the order. For example, an order containing $20,000 of fireworks will receive a 25% discount on professional fireworks but only a 10% discount on consumer fireworks. In order to qualify for volume discounts each order must be paid if full at the time the order leaves our facility. In the event that an order leaves our facility without full payment all volume discounts will be removed. Invoices which are not paid within 30 days will be subject to an interest rate of 1.5% per month. All 1.3G fireworks must be picked up at one of our locations by the customer or delivered by ACE Pyro. Equipment or supplies may be shipped by a common carrier. Additional shipping charges will be applied to your order. Please allow up to 48 hours for a staff member to contact you by e-mail or phone regarding shipping charges for your order. All orders are to be picked up at the main ACE Pyro, MI location. While some remote locations are available for pick-ups, these locations are not staffed or stocked with product. If you would like to pick-up at a remote location, you will need to coordinate your pick-up date with a staff member to verify that we will be able to transport your order by that date. Additional delivery charges will be applied. ACE Pyro is scheduling a delivery truck in the late spring to early summer. 1) A minimum of $5,000 in orders per stop. 2) A delivery fee of $10/case. 3) Orders must be paid in full (No CODs) before the truck is loaded. Customers may need to meet our truck at a designated location close to a major interstate route. Deliveries may not be available in all areas. Please call (877) 223-3552 for more information. ACE Pyro participates in several pyrotechinc club events throughout the year. If we have a truck going an event, we can usually deliver at the event as well. Delivery fees will vary depending on the location of the event and the number of customers requesting delivery. Please call (877) 223-3552 for more information. A special delivery is when you hire one of our drivers to bring you your product. The delivery costs vary from $1-$4/mile each way and fees start at $500/trip. Please call (877) 223-3552 for more information. For orders less than $100, a handling fee of $25 will be added. We use UPS or USPS international services to ship most supply and equipment orders. If you have an account with a different carrier, we will prepare your order and send you the required information for booking your shipment. Please place your order online (no payment is required at time of ordering), before asking how much shipping will be. Shipping charges vary greatly. We require a complete delivery address before we can estimate shipping charges. Charges are base on the size/weight and number of the packages. A $25 international processing fee will be added to your order. We cannot ship any fireworks or hazardous goods internationally. Please email our office at info@acepyro.com if you would like more information. A 25% re-stocking fee will be charged on all product returns. This includes any individual items removed from a held or confirmed order prior to completing the order. The re-stocking fee will be base on our regular cash price (not any discounted price) of each item. There will be a $25 charge for any returned checks due to insufficient funds. We reserve the right to correct any pricing errors. Our policies and/or prices are subject to change at any time without notice. Orders can be combined if additional items are needed at a later date. For customers without their own storage, placing a seperate order for each show is recommended, since you must take possession of entire order at time of pick-up.